Different types of stresses and their corresponding strains within elastic limit are related which are referred to as elastic constants. Modulus of rigidity or shear modulus (M, C or G). The shear modulus or modulus of rigidity (G ) describes an object’s tendency to shear (the deformation of shape at constant volume) when acted upon by opposing forces; it is defined as shear stress over shear strain. The shear modulus is part of the derivation of viscosity. The bulk modulus (K) describes volumetric elasticity, or the tendency of an object to deform in all directions when uniformly loaded in all directions; it is defined as volumetric stress over volumetric strain, and is the inverse of compressibility. The bulk modulus is an extension of Young’s modulus to three dimensions. Poisson’s ratio which is the ratio of transverse to longitudinal strains (only magnitude) in tensile test specimen is yet another elastic constant. If stress acts in three directions at a point it is called volumetric stress and produces volumetric strain. 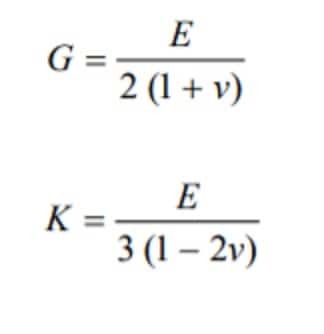 The ratio of volumetric stress to volumetric strain according to Hooke’s law is a constant, called bulk modulus and denoted by K. It is important to remember that out of four elastic constants, for an isotropic material only two are independent and other two are dependent. Thus K can also be expressed as function of any two constants. It may be understood that elastic constants E and G are not determined from tension or torsion test because the machines for these tests undergo adjustment of clearance and also some deformation, which is reflected in diagram ordinarily. The constants are determined from such devices, which show large deformation for comparatively smaller load.